Less than two hours away from the capital city of Hanoi lay an undiscovered beach oasis. 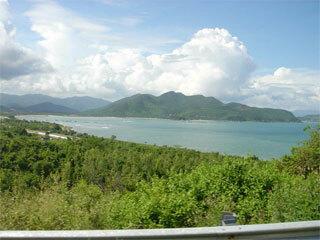 Nha Trang is located in the south central Vietnamese coast. This very affordable beach town has it all; 6km of beachfront, warm weather all year round, affordable accommodation, great food, island tours, water sports and much more. You can reach Nha Trang in a variety of different ways; however flying arguably offers the most value for your money. Flights to Nha Trang are fast and usually quite cheap. At about $60 and one and a half hours the flight from Hanoi certainly beats a 30 hour train ride. Ho Chi Minh City is even closer at only 9 hours by bus or 40 minutes on Vietnam Airlines. As soon as you take your first breath of that fresh tropical air on the tarmac of Nha Trang’s refreshingly simple airport you know that you have just arrived in a place where time moves just a little bit slower and most problems seem to suddenly seem unimportant. Once on the ground you must make your way to Nha Trang’s city centre which is accessible by taxi or private car at about $10 and $18 respectively. The journey will take you through a scenic highway that winds along the mountains and hugs the coast most of the time. The journey takes about 40 minutes. Once you reach the city centre you are not short on options of where to stay. Nha Trang has a variety of hotels that range from the inexpensive to a luxury bungalow on a private beachfront. For $7 a night you can expect to stay in a hotel with a basic but nice room with sea views, Most hotels will have in house restaurants that serve food throughout the day, satellite TV and an in-house travel service that is able to book island tours, water sports, scooter rentals or tickets to your next among others. 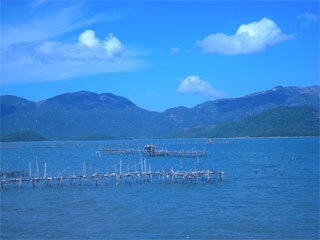 There is always something to do around Nha Trang no matter how long you stay. Whether you prefer laying on the beach starring into perfectly blue waters or something more active there is an option for you. Nha Trang is known as a very scenic diving spot with beautiful coral reefs very near by it is quite easy to peek into the underwater world. If you are already diving certified you can do a whole day of diving for as little as $ 30 with all the equipment included. If not, don’t worry because you can get certified for just over $200 which includes all equipment rentals, classes, boat trips, and usually lunch. If diving is not for you, there are many tours that take you snorkeling around the coral reefs. Island tours are quite popular; there are many different ones and most of them will begin early in the morning and finish during mid-late afternoon. 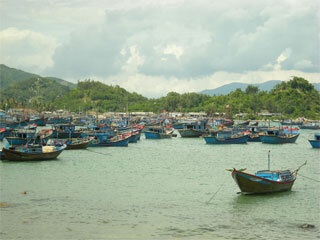 For under $10 you can expect to visit several islands off the coast of Nha Trang, lunch included. If you prefer something more active there are a lot of water sports available such as Jet Ski rentals, parasailing, jet skiing, etc. You can arrange them through your hotel or an individual operator. You are never short of food and drink options in Nha Trang. While you lay relaxing on the beach all day several people will come by and drop off flyers for different restaurants and bars. Most of them will include an abridged version of their menu and some special offers that you receive if you bring in the flyer. As the sun sets on this small Vietnamese town the bars and restaurants come alive and suddenly it is time to put those flyers you got during the day to good use and decide where to start the night. You will have a varied choice of cuisines from Italian to Mexican to Indian and of course Vietnamese. Local - is a small, nicely decorated Italian restaurant. It is run by a very friendly Vietnamese staff who will attend to your every request as far as food and drinks go. The pizza and brushetta are especially delicious. To accompany your food you have a selection of natural fruit juices, local and imported beer, and a selection of cocktails including a very refreshing Mojitò. Texas BBQ and Steaks - A very surprising find in the middle of Vietnam was Texas BBQ and Steaks. Owned and managed by a local of Tampa Bay, Florida USA this restaurant brings true American style BBQ to Vietnam. The selection ranges from vegetarian cheese quesadillas, chicken wings and proper American hamburgers to barbeque ribs and chicken with potato salad, coleslaw, and steamed corn. The atmosphere will take you to somewhere in middle America with classic rock playing in the background and an imposing Texas flag hangs form the back wall, the side walls are decorated with classic movie and music posters. Why Not? - Why not? Bar is perhaps the most popular bar/club in Nha Trang. Half indoors and half outdoors, it has a lively atmosphere throughout the night. Indoors there is a dance floor, a pool table, and a huge bar. The outdoor section consists of tables, chairs and another pool table. International music usually with a western inclination is audible throughout the bar. The drink selection includes local and imported beer, a wide range of cocktails and buckets of alcohol! Local food - All restaurants whether local or international cuisine will have a good selection of Vietnamese dishes. If you want something more rustic there are street stalls every few corners serving up unbelievably cheap and delicious food. Whether you like to relax and just lounge on the beach drinking coconut water all day and work on your tan or go watch the sunrise from your dive boat and then see the coral reefs come alive with the first rays of sunlight in the morning and go jet skiing in the afternoon. There is always something to do and discover in sunny, undiscovered Nha Trang.